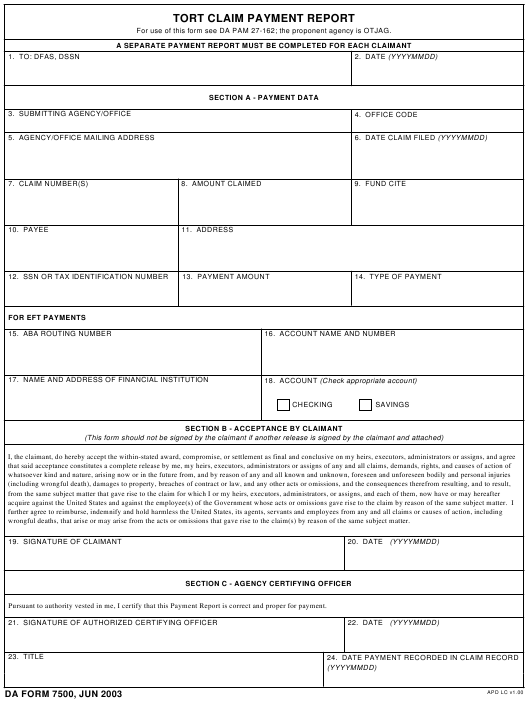 DA Form 7500 - also known as the "Tort Claim Payment Report" - is a Military form issued and used by the United States Department of the Army. The form - often mistakenly referred to as the DD form 7500 - was last revised on June 1, 2003. Download an up-to-date fillable PDF version of the DA 7500 below or request a copy through the chain of command. wrongful deaths, that arise or may arise from the acts or omissions that gave rise to the claim(s) by reason of the same subject matter. Pursuant to authority vested in me, I certify that this Payment Report is correct and proper for payment.